Lemonade Scones Recipe – Delicious Lemonade Scones! 4.5 stars based on 35 reviews Total time: 1 hour 30 min Serving size: 1 medium slice Calories per serving: 250 cal Fat per serving: 12 g Ingredients:	3 cups of self raising flour 1 cup of thickened cream 1 cup of lemonade 4 tablespoons milk Optional Extras: sultanas, dates or cinnamon if desired. 1. Preheat oven to 220°C. 2. Place sifted flour, cream and lemonade into a large mixing bowl. 3. Fold ingredients together with your hands, a spoon or cut them in with a knife until just combined. The dough should be sticky and not too dry – avoid adding too much extra flour. Ensure any kneading and folding is kept to a minimum so that the scones are light and fluffy. 4. Place the mixture on a lightly floured bench, gently knead (do not use a rolling pin) until combined. Press the dough out to approximately 5cms thickness. 5. Use a cookie cutter or other round cutter to create around 6cm scones. You may find it easier to cut the scones if you lightly coat the cutter in flour. 6. Place scones close together (just touching) on a lightly greased baking tray to help them rise upwards and maintain their shape. Brush the tops with the milk, or as an alternative, a lightly beaten egg. 7. Bake for 10-15 minutes until lightly browned. This lemonade scones recipe is the best – light, fluffy and so very easy to make, it’s foolproof! Let us know what you think of our lemonade scones recipe by leaving your comments below. If you prefer the tops of the scones to be crusty, cool on a wire rack as soon as you remove them from the oven. But if you prefer soft tops, you can achieve this by wrapping them in a tea towel instead. Enjoy these light and fluffy lemonade scones while you can – they’ll race out the door! Optional Extras: sultanas, dates or cinnamon if desired. Place sifted flour, cream and lemonade into a large mixing bowl. Fold ingredients together with your hands, a spoon or cut them in with a knife until just combined. The dough should be sticky and not too dry – avoid adding too much extra flour. Ensure any kneading and folding is kept to a minimum so that the scones are light and fluffy. Place the mixture on a lightly floured bench, gently knead (do not use a rolling pin) until combined. Press the dough out to approximately 5cms thickness. 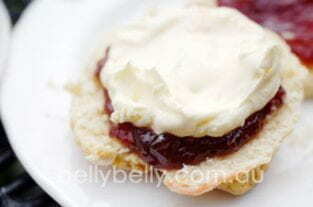 Use a cookie cutter or other round cutter to create around 6cm scones. You may find it easier to cut the scones if you lightly coat the cutter in flour. Place scones close together (just touching) on a lightly greased baking tray to help them rise upwards and maintain their shape. Brush the tops with the milk, or as an alternative, a lightly beaten egg. Bake for 10-15 minutes until lightly browned. Absolutely soft and fluffy scones. Great recipe will be using for the future for sure. So easy!!! Love it.